A mandatory evacuation order is in effect for Zone A. All New York City public schools are closed for students through Friday. Cars traveling into Manhattan using the four East River bridges will be restricted to High Occupancy Vehicles - 3 or more people per vehicle - for Thursday and Friday from 6:00 AM to 12:00 Midnight. 76 evacuation centers have been prepared throughout the city as military and law enforcement units mask for the storm that has 375,000 NYC residents mandated to evacuate. NEW YORK — As of late Sunday, orders were given to deploy 1175 National Guard troops into the New York City region of the United States in preparation for the mandatory evacuation of “Zone A” which contains a civilian population of 375,000 people. 400 National Guardsmen have now been deployed into Long Island, 200 in New York City, and the remainder will disperse in the surrounding areas. The New York City subway and other transportation hubs are shutdown and are now on full-scale lock down as the city is now in full button up status. Libraries and other government facilities will remain closed. Public schools have been allotted and have been set up as temporary FEMA camps or makeshift shelters (78 throughout the city), as not all evacuee’s will make it out of the city. On behalf of the Orange County Toy Collaborative. “Spark of Love” Holiday Toy Drive. Collaborative is now in dire need of a warehouse. • Have an Orange County location, preferably east of the 55 Freeway. • Have 35,000 – 50,000 square feet of space. • Have a minimum of two loading docks, one for incoming and one for outgoing toys. • Have electricity throughout the building to operate small office equipment. • Minimum 12-24-month lease agreement. The Orange County Toy Collaborative combines the efforts of the Orange County Firefighters’ “Spark of Love” toy drive, the U.S. Marine Corps’ “Toys for Tots” toy drive, Social Service Agency’s “Operation Santa Claus” program, and the Orange County Society of St. Vincent de Paul holiday charities program. Collectively, these campaigns receive and distribute an average of 300,000 toys annually for needy children and families throughout Orange County. All toy donations, monetary donations, and warehouse use is tax deductible through its 501(c)3 non-profit status, Federal I.D. Number 01152064; make sure to consult with a tax professional on this matter. You can call Dee Acevedo, the warehouse manager at (714)679-3738, or Brenda Emrick if you have a building for lease. ALBANY, N.Y. — Gov. Andrew Cuomo says President Obama is sending crews and equipment from the Army and Navy to help pump out New York City’s swamped subway tunnels. He says an elite Army “de-watering” team that had been deployed during Hurricane Katrina is being sent from Illinois. That team should be pumping out large amounts of seawater by Thursday morning. The Navy is also sending pumps used on ships. Cuomo says Wednesday the job is immense. He says the PATH commuter line tunnels to New Jersey are filled to the standing platforms for five miles. The state’s Metropolitan Transportation Authority says every day the subway system is closed costs it $18 million in revenue. Buses are now being used to help carry 5.5 million daily subway riders. FOR IMMEDIATE RELEASE - October 31, 2012 - Ameridose today announced it will commence a voluntary recall of any unexpired products remaining in circulation. This action is voluntary, and represents an expansion of our cooperation with the U.S.Food and Drug Administration and the Massachusetts Board of Registration in Pharmacy. During the course of its on-going inspection of our facility, FDA has notified Ameridose that it will be seeking improvements in Ameridose’s sterility testing process. Ameridose and FDA agree that the use of injectible products that are not sterile can represent a serious hazard to health and could lead to life-threatening injuries and/or death. Ameridose has not received any adverse reports related to the products subject to this recall and neither Ameridose nor the FDA has identified impurities in any Ameridose products. Nevertheless, out of an abundance of caution, we are undertaking this recall to assure customers that when Ameridose products are shipped, they are fully in conformance with all of the FDA’s recommendations. Products from Ameridose can be identified by markings that indicate Ameridose by name or by its company logo. A complete list of all products subject to this recall can be accessed on-line at www.ameridose.com. Product was distributed nationwide to healthcare facilities. Ameridose is notifying its customers by fax and is arranging for return of all recalled products. Customers that have Ameridose products which are all affected by this recall should immediately examine their inventory and quarantine products subject to this recall, complete the form regarding the current status of these products, and return the form to Ameridose by fax at 508-656-6596, or by email at amdservice@ameridose.com. Copies of the recall letter and form are available on the Ameridose website atwww.ameridose.com. A full list of products will be available this afternoon at www.ameridose.com. Customers with questions regarding this recall can contact Ameridose by phone at 888-820-0622 on Monday through Friday from 9:00 am to 5:00 pm EST, or by email atamdservice@ameridose.com. Consumers should contact their physician or healthcare provider if they have experienced any problems that may be related to taking or using this drug product. Regular Mail: use postage-paid, pre-addressed Form FDA 3500 available at: http://www.fda.gov/MedWatch/getforms.htm. Mail to address on the pre-addressed form. As Storm #Sandy barreled down on the Northeast on Monday, a one-woman response team at the Fire Department of New York monitored Twitter through the night to help people in need. Rahimi works as a public relations, writing and social media maven for the New York City Fire Department — where she’s constantly juggling the demands of unpredictable days. A career writer, she also pens lifestyle stories for newspapers and magazines across the country. Gorgeous FDNY Social Media Manager Emily Rahimi, a seven-year veteran at Fire Department of New York kept New Yorkers updated on developments from a storm that flooded many parts of the city Monday night through the official department Twitter feed. In a flurry of more than 100 tweets, Rahimi, who was still working at her desk on Tuesday morning, replied to cries for help sent out on the social media service, passed along updates from Mayor Michael Bloomberg and followed up when New Yorkers posted tweets of thanks. Rahimi posted updates to the official @FDNY Twitter account urging those facing emergencies to dial 911. Because the response effort was divided among city government agencies, calling 911 allowed dispatchers to filter out assignments instead of every request going to the fire department. "*Do not* tweet emergency calls," Rahimi wrote as the storm hit. But for those unable to access a phone or who could not get through, Rahimi was there to help. "My friends' parents who are trapped on #StatenIsland are at 238 Weed Ave. Water almost up to 2nd flr.," posted Michael Luo, an investigative reporter for The New York Times. 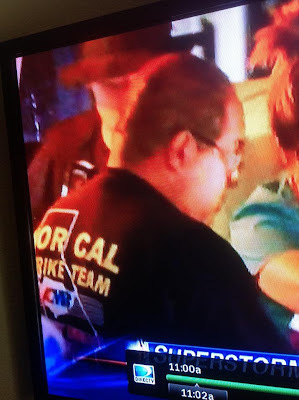 "I have contacted dispatch," Rahimi responded within minutes. "They will try to send help as soon as they can." Rahimi's tweets sometimes helped serve as a much-needed voice of support while victims of the storm waited for help to arrive. "[A] volunteer's brother is trapped in 301 oriental blvd apt 4h can u help us?" a user with the account name @bklyndafna posted on Twitter. "Has he called 911?" Rahimi posted in response. "yes no response," @bklyndafna said. "That area is busy now. Units are working as quickly/safely as possible. Will make sure dispatch is on it. Keep in touch with him," Rahimi wrote back. FEMA has developed a next generation of rapidly deployable emergency response teams called Incident Management Assistance Teams (IMATs). The IMATs are full-time, rapid-response teams with dedicated staff able to deploy within two hours and arrive at an incident within 12 hours to support the local incident commander. The teams support the initial establishment of a unified command and provide situational awareness for federal and state decision-makers crucial to determining the level and type of immediate federal support that may be required. IMATs were developed from an expanded concept of the former Emergency Response Teams (ERT) at the National and Regional levels. The plan is to establish three National IMATs with 16 fulltime staff, and 13 Regional IMATs staffed with 4 fulltime and 6 collateral duty personnel each. remaining one National and three Regional IMATs will be established later this year. IMATs provide a forward federal presence to facilitate the management of the national response to catastrophic incidents. 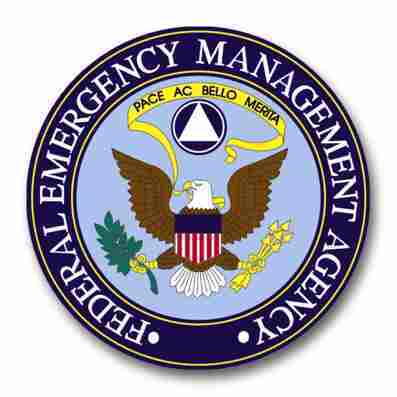 The primary mission of a FEMA IMAT is to rapidly deploy to an incident or incident-threatened venue, provide leadership in the identification and provision of federal assistance, and coordinate and integrate inter-jurisdictional response in support of an affected state or territory. 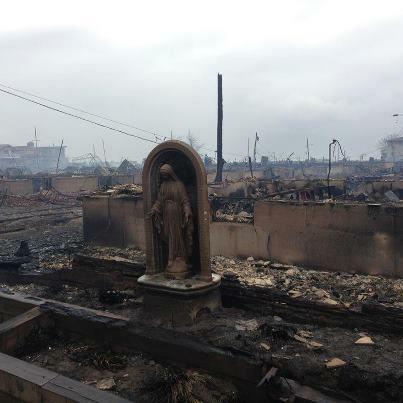 Our thoughts and prayers go out to those who have been affected by Hurricane Sandy. While the worst of the weather is beyond some areas on the East Coast, Sandy remains a very large storm system that continues to pose life-threatening hazards for coastal and inland areas including high winds, heavy rains, dangerous storm surge and flash flooding, and snow and cold weather hazards in some areas. Continue to listen to your local officials – If you evacuated and are returning home, make sure local officials have deemed the area safe to return to. If Sandy is still impacting your area and local officials give the order to evacuate, do so immediately. Stay off the roads - Emergency workers may be assisting people in flooded areas or cleaning up debris. You can help them by staying off the roads and out of the way. If your power is out, safely use a generator or candles - Never use a generator inside a home, basement, shed or garage even if doors and windows are open. Keep generators outside and far away from windows, doors and vents. Read both the label on your generator and the owner's manual and follow the instructions. If using candles, please use caution. If possible, use flashlights instead. If you must use candles, do not burn them on or near anything that can catch fire. Avoid downed power or utility lines - They may be live with deadly voltage. Stay away and report them immediately to your power or utility company. Don’t drive or walk through flood waters – It only takes a small amount of water to move people or vehicles. If you encounter a flooded roadway, don’t attempt to pass through water – turn around, don’t drown. And if your home has flood water inside or around it, don’t walk or wade in it. The water may be contaminated by oil, gasoline or raw sewage. Numerous blood drives have been canceled as a result of the storm and the Red Cross has a need for blood donations. To schedule a blood donation or for more information about giving blood or platelets, visit redcrossblood.org or call 1-800-RED CROSS (1-800-733-2767). Declared counties in New York: Bronx, Kings, Nassau, New York, Richmond, Suffolk, & Queens. Those impacted can also apply by calling 1-800-621-FEMA(3362) or 1-800-462-7585 (TTY) for the hearing and speech impaired. functions such as fire prevention (code enforcement, plans review, fire protection system checks, and vegetation management), life safety education, regional dispatch services, training, apparatus repairs, logistics, etc. The District protects the cities of Antioch, Clayton, Concord, Lafayette, Martinez, Pittsburg, Pleasant Hill, San Pablo, and Walnut Creek as well as unincorporated areas of the County including Bay Point, El Sobrante, and Pacheco. In 2011, the District responded to 41,500 incidents. benchmark against other organizations to evaluate our service delivery and support operations. Each community has unique characteristics such as threats/risks, demographics and population density, environmental factors (area served, topography, water supply, weather, transportation corridors, etc. ), stakeholder groups, baseline resources, availability of mutual and automatic aid, etc. that must be evaluated before service delivery decisions are made. Service delivery options or solutions that are appropriate for one community may be unacceptable for another community as many of the relevant factors are different. and bulk storage facilities, chemical plants, hazardous materials transportation (rail, ship, pipeline, and highway), high rise buildings, large commercial and industrial buildings, multiplefamily dwellings, health care facilities, and institutional and educational facilities. Additionally, the area presents a significant wildland fire-urban interface threat, as well as potential for natural disasters such as floods and earthquakes. The District routinely responds to structure fires, vegetation fires, medical emergencies, vehicle accidents, rescue calls, utility emergencies, etc. As such, the District’s “all-hazards” approach provides added value to the services we provide to the community. Federal Emergency Management Agency awarded the city of Detroit $22.5 million. This is the largest grant in the history of FEMA’s Staffing for Adequate Fire and Emergency Response program. The funds will be used to cover the compensation (salaries and benefits) for two years for 108 Detroit firefighters who would’ve been laid off due to budget constraints. The men and women of the Detroit Fire Department would like to thank filmmakers Tom Putnam and Brenna Sanchez for their new film “Burn,” their moving look at the heroism and “right stuff” displayed around the clock by our department. They also cast an unflinching light on many of the conditions under which our firefighters work and the many challenges they face servicing one of the nation’s physically largest cities at nearly 140 square miles. Mayor Dave Bing has made public safety his top priority and remains committed to keeping the city safe. He has worked closely with this department to address the needs in servicing those who live, work and entertain in the city of Detroit. In these weeks leading up to Angels’ Night, the city and this department encourage Detroiters to join us in moving our city forward. Those of us in leadership positions do understand the urgency of the situation. We are working with aging physical plant and equipment, an imperiled budget and city finances, and a complex, challenging urban environment, for both firefighters and our EMS services. Our 37 fire stations have an average age of more than 80 years. Our budget simply hasn’t allowed for adequate remodeling or relocation of these structures, or the repair or replacement of fire engines, ladder trucks or ambulances. We are plagued continually by fires in the city’s more than 39,000 dangerous structures, many of which catch fire again and again. Of the nearly 7,000 total fires we fight each year, more than half are at vacant dwellings, which put firefighters’ lives at risk as we try to make sure no squatters are inside when we respond. Help is on the way. Despite these challenges, our response times are excellent, and we continue to make progress in prevention programs, which include home and business fire prevention inspections, free home smoke alarm programs and our Halloween-period efforts. As “Burn” clearly demonstrated, our firefighting skills and bravery on the line are second to none. This department is committed to finding ways to use our existing budget more effectively, while forging new relationships with and drawing support from citizens, the philanthropic community and government grant programs. Working with the Detroit Public Safety Foundation funded grant writers and department staff, this June, the Federal Emergency Management Agency awarded the city of Detroit $22.5 million. This is the largest grant in the history of FEMA’s Staffing for Adequate Fire and Emergency Response program. The funds will be used to cover the compensation (salaries and benefits) for two years for 108 Detroit firefighters who would’ve been laid off due to budget constraints. This most welcome award represents almost 14 percent of our department’s annual budget. In recent days, FEMA awarded a second SAFER grant to Detroit in the amount of $5.6 million. The funds will be used to cover the compensation for two years for 26 more Detroit firefighters who had been laid off due to budget constraints. We ask citizens and businesses to continue to get involved in making Detroit a safer and more attractive city. More information can be found at the Detroit Public Safety Foundation’s website (www.detroitpublicsafetyfoundation.org), including a list of needed items. I know that this department and this city have the resolve to put out any fire of self-doubt about our future. Contra Costa's largest fire agency will shutter four fire stations in January, close up to six more by 2015, and stop responding to low-priority incidents if voters reject a $75 annual parcel tax on the general election ballot. 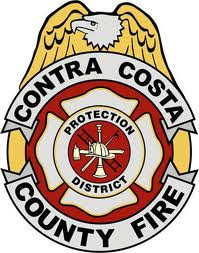 MARTINEZ -- "We are planning for the worst and hoping for the best, hoping we will not have to implement this service-reduction plan," Contra Costa Fire Chief Daryl Louder told the county Board of Supervisors on Tuesday. The board governs the 600,000-resident central Contra Costa County fire district. Measure Q, the fire district's seven-year parcel tax proposal, needs a steep two-thirds approval at a time when recession-weary voters face a plethora of new tax proposals from cash-starved state, school and local agencies. Ballot measure opponents have repeatedly said the fire district is holding taxpayers hostage, threatening service losses while refusing for years to reform firefighter pensions or seriously evaluate alternative ways to fight fires and respond to medical emergencies. But no matter which argument the voters ultimately endorse, the math is indisputable: Without Measure Q's roughly $17 million a year in additional property tax proceeds, the fire district will burn through its reserves in a matter of months and must cut expenses. The reductions have consequences, Louder said. Losing 10 of its 28 stations will lead to longer response times, more fire damage, greater chance of injury or death for emergency patients, and reduced participation in the regional and state mutual aid system, he predicted. The agency hasn't yet identified the stations within its nine cities and unincorporated communities targeted for closure. Operational staff is working on a closure priority list and will consider factors such as proximity to other fire stations, refineries or other high-risk facilities, busy freeways and call volumes. But in neighborhoods where stations remain open, the firefighters must absorb the extra calls and extend their staff and equipment further, the chief said. "The call volume isn't going to go down, it will just be redistributed to the open stations," Louder said. "No part of the district will escape the impacts." However, no firefighters will lose their jobs in the initial shutdown in January, Louder said. Instead, the district will eliminate the overtime that has allowed those stations to remain open even with reduced staffing levels. It takes a minimum of two firefighters and one firefighter-paramedic to operate each engine or ladder truck. While many firefighters want and rely on overtime to augment their salary, the district is increasingly mandating overtime in order to meet the staffing requirements, Louder said. Eliminating overtime means no staff is available to operate those engines and trucks. Fire service cutbacks will also impact the county's ambulance service, Emergency Medical Services Director Patricia Frost told county supervisors Tuesday. While the county's contract with American Medical Response, or AMR, mandates maximum transport times, ambulance personnel rely heavily on firefighters trained and equipped to extricate people from wrecked cars, burning buildings or even from behind locked doors. Fire station closures may lead to more incidents in which ambulance staff is first on the scene and unable to get access to the most critical patients, such as those in trauma situations or in cardiac arrest, Frost said. "Fire is a critical link," she said. " ... What we're talking about are fundamental changes in our service capabilities that are unprecedented." If Measure Q fails, the Board of Supervisors will likely make station closure decisions at a public hearing in early December. It is with great sadness that I announce the passing of Santa Clara Unit Battalion Chief Rob Van Wormer. Rob passed away Saturday evening while on assignment in Santa Cruz. Rob lost consciousness and was immediately transported to Dominican Hospital. Despite numerous attempts to revive him, he passed away at approximately 8:00 p.m.
His wife Jennifer and their two sons were brought to Santa Cruz and have been joined by his parents and his sister. As many of you know, Rob's brother, Kirk, is a Battalion Chief for CAL FIRE in the Sonoma Lake-Napa Unit. This is a huge loss for Rob's family, his many friends, his CAL FIRE family and the fire service as a whole. Please join me in keeping the Van Wormer family in your thoughts during this very difficult time. We will share information concerning the memorial service as it becomes available. I am directing all CAL FIRE facilities to immediately lower flags to half staff and all uniform personnel to shroud badges until the conclusion of Chief Van Wormer's memorial services. Ice Cream When You Get Back! Subway system could remain closed for up to four days until flood waters are pumped from tunnels, authorities said on Tuesday, but there was yet no timetable for when the system would reopen - Floodwaters rushed through Lower Manhattan on Monday night, inundating some tunnels and likely leaving New York City’s mass-transit system hampered for days. No clear estimate was available, and the Metropolitan Transportation Authority did not provide a timetable for reopening the subways. 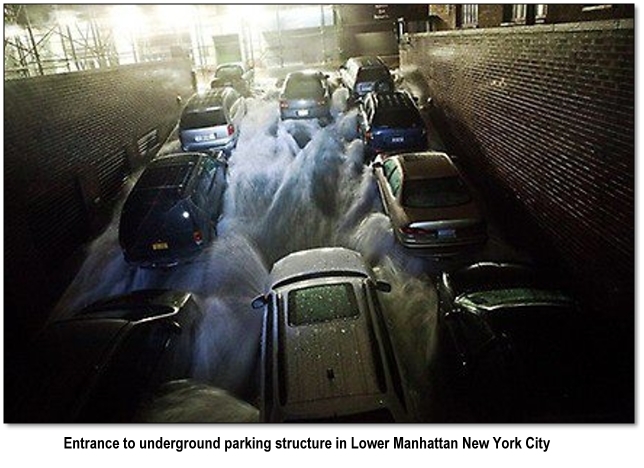 But the extent of flooding and the height of the storm surge appeared likely to meet or exceed the level of a 1992 nor’easter that forced the temporary closure of subway tunnels for both the MTA and the Port Authority of New York and New Jersey. An MTA spokesman said late Monday night that water had reached into some of the five subway tubes that stretch under the East River between Lower Manhattan and Brooklyn, although it wasn’t yet clear which tunnels had been affected or how much water had entered the system. The spokesman said floodwater had also been found in the underground tunnel that carries the no. 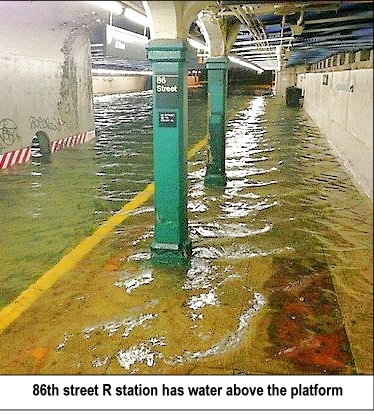 1 train to South Ferry at the tip of Manhattan, one of the low-lying stations about which officials had been most concerned because of the chance for flooding. 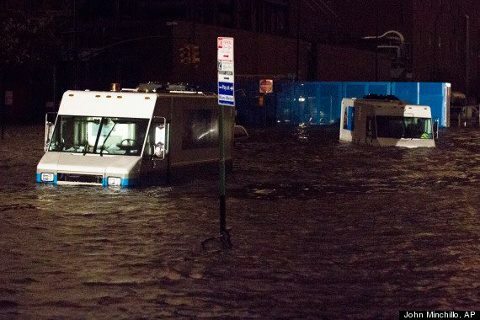 “There’s been an enormous surge that’s come up, some streets two and three feet under water,” MTA Chairman Joseph Lhota said in a telephone interview earlier Monday evening after a tour of Lower Manhattan. 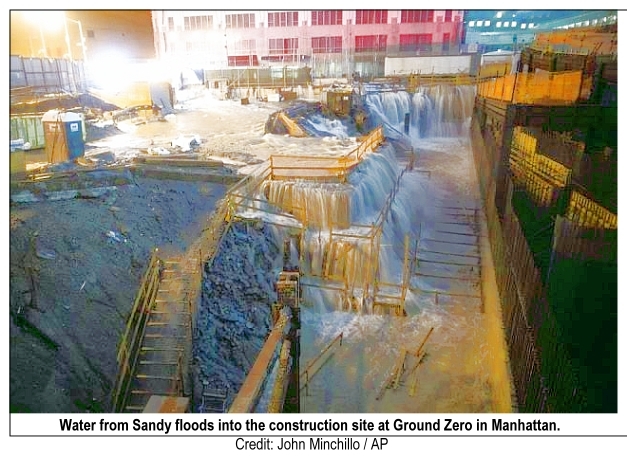 Water is “flowing at great speed” from the West Side Highway into the Brooklyn-Battery Tunnel, he said, but it’s too early to say how much had entered the subway system. 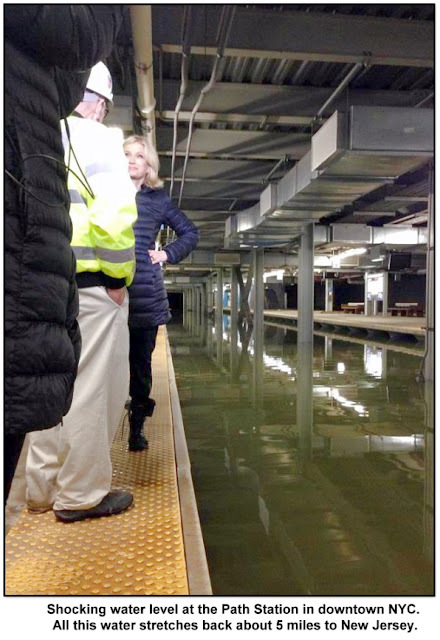 A previous statement from the MTA that four feet of water had entered the subway tunnels in fact referred to water pooled inside a subway station, a spokesman said. “This is quite serious,” Lhota said. 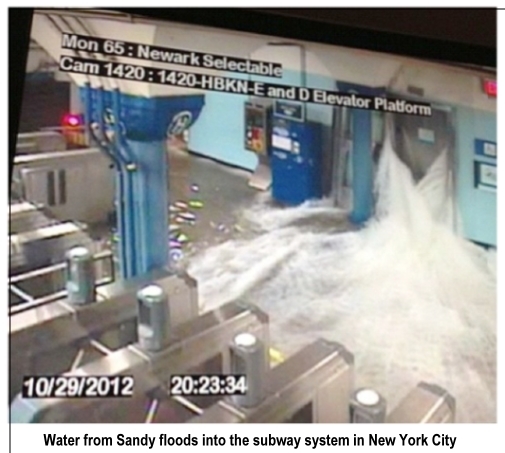 Transit workers were beginning to enter the subway system in the evening to assess damage and any incursions of water. 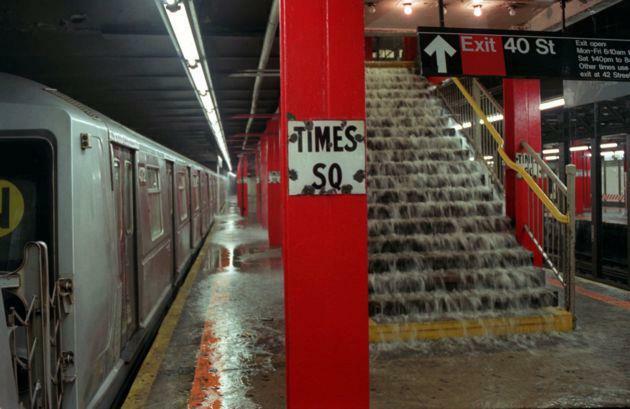 The subway system is complex, Lhota said, and some lines less affected by the flooding in Lower Manhattan could likely be restored to service sooner than others. Much remained unknown on Monday night. ”We’re trying to get an estimate of what if anything we’re dealing with here,” he said. As the Journal reported Monday evening, transit workers had been moving to seal off openings that could allow corrosive salt water to sweep into the subway system and incapacitate trains. The threat of an extended shutdown loomed over a system that carries 5.2 million passengers a day and is essential to the city’s economy. More than 190 firefighters contained the blaze but were still putting out some pockets of fire more than nine hours after it erupted at the height of Hurricane Sandy, fighting winds, flooded streets and no water pressure as at least 80 homes destroyed in the wind driven Rockaway Queens conflagration. FDNY Update: 6th Alarm. Breezy Point. Fire has been reduced to numerous smoldering foundation expanse Atlantic walk to Jamaica walk and Ocean Avenue to the promenade no searches have been conducted moving companies due to incoming tide approximately 50 homes destroyed, 50 homes completely gone 10 homes still actively burning. Note: FDNY's response matrix. A 5th alarm is 20 Engines, 11 Ladders, 5 Battalion chiefs, and 1 District Commander. There isn’t even a 6th Alarm on their matrix. NEW YORK (AP) — A huge fire destroyed 80 to 100 houses in a flooded beachfront neighborhood Tuesday, forcing firefighters to undertake daring rescues and injuring three people. More than 190 firefighters contained the blaze but were still putting out some pockets of fire more than nine hours after it erupted. As daylight broke, neighbors walked around aimlessly through their smoke-filled Breezy Point neighborhood, which sits on the Rockaway peninsula jutting into the Atlantic Ocean. Electrical wires dangled within feet of the street. Officials said the fire was reported around 11 p.m. Monday in an area flooded by the superstorm that began sweeping through the city earlier. Firefighters told WABC-TV that the water was chest high on the street, and they had to use a boat to make rescues. They said in one apartment home, about 25 people were trapped in an upstairs unit, and the two-story home next door was ablaze and setting fire to the apartment's roof. Firefighters climbed an awning to get to the trapped people and took them downstairs to a boat in the street. Video footage of the scene showed a hellish swath of tightly packed homes fully engulfed in orange flames as firefighters hauled hoses while sloshing in ankle-high water. 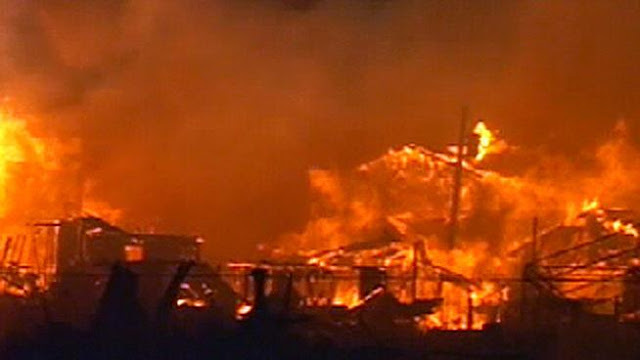 Many homes appeared completely flattened by the wind-whipped flames. Injuries: One firefighter suffered a minor injury and was taken to a hospital. Two civilians suffered minor injuries and were treated at the scene. At the direction of President Obama, the Federal Emergency Management Agency (FEMA) is coordinating the federal government's assistance and preparations to support states affected by Hurricane Sandy. Today, the President received a briefing on Hurricane Sandy in the White House Situation Room, including an update on the deployment of teams and resources to potentially affected areas by Homeland Security Secretary Napolitano, FEMA Administrator Fugate, Transportation Secretary Lahood, Energy Secretary Chu and National Hurricane Center Director Richard Knabb. Currently, more than 1,500 FEMA personnel are positioned along the East Coast working to support disaster preparedness and response operations, including search and rescue, situational awareness, communications and logistical support. In addition, 28 teams comprised of 294 FEMA Corps members are pre-staged to support Sandy. Three federal urban search and rescue task forces are positioned in the Mid-Atlantic and ready to deploy as needed and requested. An additional four federal search and rescue task forces in the Mid-west have been placed on alert and are ready for deployment, as requested and needed. 14 Incident Management Assistance Teams and 12 liaison officers are positioned in potentially affected states along the East Coast to support preparedness activities and ensure there are no unmet needs. Mobile Emergency Response Support (MERS) personnel and teams have been deployed to support the states with secure and non-secure voice, video, and information services, operations, and logistics support to state response operations as well as with any potential requests for assistance. FEMA disability integration advisors are also deployed to advise emergency management on alert and warning, evacuation, and sheltering needs. At all times, FEMA maintains commodities, including millions of liters of water, millions of meals and hundreds of thousands of blankets, strategically located at distribution centers throughout the United States and its territories, including Atlanta, Ga. and Frederick, Md., if needed and requested. FEMA distribution centers have an overall inventory of more than 5 million liters of water, 3 million meals, 900,000 blankets and 100,000 cots. FEMA and the Department of Defense established Incident Support Bases in Westover, Mass. and Lakehurst, New Jersey to pre-position supplies including water, meals, blankets and other resources closer to potentially impacted areas, should they be needed and requested by states. As of this morning, FEMA has moved roughly 200,000 liters of water, 100,000 meals and thousands of blankets and cots to Westover Air Reserve Base; and more than 400,000 liters of water and more than 390,000 meals and thousands of cots to Lakehurst Naval Air Station in Lakehurst, New Jersey, and more commodities are en route, as weather conditions permit. Those in the forecasted areas that will be affected in the next 24 hours should complete preparations immediately. Those in areas that will experience impacts on Wednesday and Thursday should be preparing their family, home or business to lessen the impact of severe weather, making sure to have an emergency plan, and emergency kits in their homes, workplace and cars. Some of the items in a basic emergency kit include: one gallon of water per person per day, for drinking and sanitation; at least a three-day supply of non-perishable food; battery-powered radio and a NOAA Weather Radio; flashlight and extra batteries; and First Aid kit. More information about what to do before, during and after a disaster can also be found visiting www.ready.gov andwww.listo.gov. The FEMA mobile site (http://m.fema.gov), smartphone app (www.fema.gov/smartphone-app), and text messages (www.fema.gov/text-messages) also provide regular updates. Sharing information using social media tools is also a good way for residents to stay informed. Follow FEMA online at www.fema.gov/blog, www.twitter.com/fema, www.facebook.com/fema, andwww.youtube.com/fema. On your phone: http://m.fema.gov, smartphone app www.fema.gov/smartphone-app, and text messageswww.fema.gov/text-messages also provide regular updates. Sharing information using social media tools is also a good way for residents to stay informed. FEMA online: www.fema.gov/blog, www.twitter.com/fema, www.facebook.com/fema, andwww.youtube.com/fema. We want to hear your suggestions on how we can improve our communications to you, be sure to email us atcitizencorps@dhs.gov.